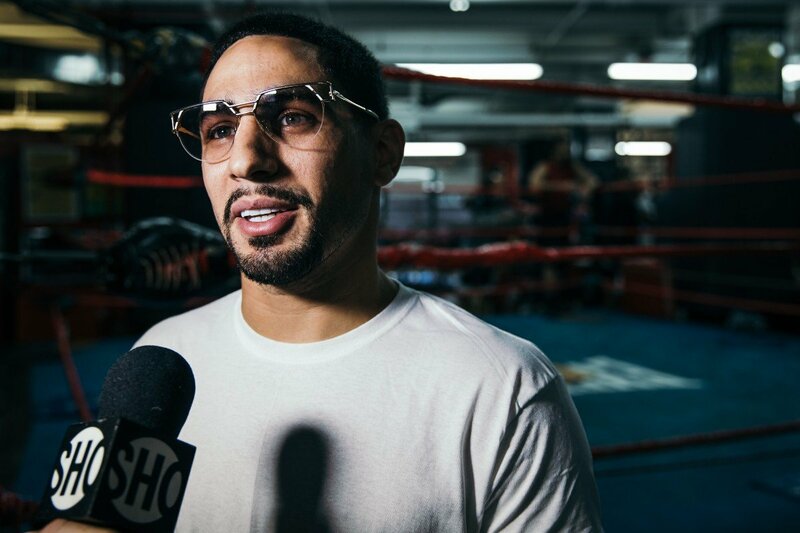 Welterweight stars Danny Garcia and Shawn Porter kicked off fight week in Brooklyn Wednesday with media workouts ahead of their showdown for the vacant WBC Welterweight World Championship taking place this Saturday, September 8 live on SHOWTIME from Barclays Center, the home of BROOKLYN BOXING™ and presented by Premier Boxing Champions. The SHOWTIME CHAMPIONSHIP BOXING telecast begins at 9 p.m. ET/6 p.m. PT and features a welterweight title eliminator between Yordenis Ugas and Cesar Barrionuevo and heavyweight action that pits unbeaten Polish slugger Adam Kownacki against former heavyweight champion Charles Martin, all of whom participated in Wednesday’s workout. The media workout also featured fighters competing in streaming action on SHOWTIME CHAMPIONSHIP BOXING COUNTDOWN (7 p.m. ET/4 p.m. PT) as five-division world champion Amanda Serrano attempts to win a world title in her record sixth weight class when she faces Yamila Esther Reynoso for the WBO 140-pound title. “This is a very important fight for me. This fight is an opportunity to prove that I’m still one of the best fighters in the world. I’m coming to get my belt back. “Shawn’s style is exactly what I like to go up against. I want him to come forward and walk into my counter punching. I have power in both hands and I’m going to make him feel it. “If he comes and opens up, I’m going to land a clean shot early. If he can’t recover, then I’m going to have a chance to finish him. I’m going to dictate the pace and fight my fight. “I’m ready for anything. I’m prepared to fight backwards, forwards or whatever I need to do. I have to set the tempo and dominate. Shawn is very hungry, so it’s important for me to be smart and pick my spots. “I know he’s going to try to jab his way in. Shorter guys like him tend to go to the body too. He has skills but I’ve had great preparation to be ready for any of it. We have some stuff up our sleeve. “We’re just working smarter not harder this camp. We’ve worked on our agility a lot and we tried some different things to keep my legs strong. “This is a huge fight. It’s the biggest fight of my career and my life. I’ve been doing this since I was eight and I can’t think of an opportunity that I’ve wanted more in my life. This is my Super Bowl. “I’m not looking for any surprises on Saturday. I’m very familiar with his game plan and what he does well. I expect to use my speed, box from the outside, be aggressive and win the fight. “The Kell Brook fight is only on my mind because I know that’s a fight someone will watch to try to figure out how to stop me. He’s going to try and hold like in that fight and do it even more than Brook did. Other than that, he has no chance of catching me coming in. “It’s going to be everything I do that will help me get this win. It’s the work rate, power and a different level of speed than he’s used to. Nobody has my combination of that power and speed. “I just don’t think Danny can handle me. He says I’m tailor-made for him, but we’ll see on Saturday night. “I’m very proud and happy to be a top contender at welterweight. I’m ready to fight any champion who is willing to get in the ring with me. I’ll be ready for each of them and we know it’s just a matter of time. “I want all of the big fights. I want to build my legacy and I’m prepared to go through any of them. I think I could give Errol Spence Jr., Danny Garcia or Shawn Porter a great fight and beat any of them if they step up to the plate. “I know that I have a tough opponent in front of me. I take him very seriously, but I also know that I have the skills to beat him and make it an exciting fight. “My goal is to bring my best possible fight and get the victory on Saturday. From there I’m going right for the WBC title. “Ugas is a strong fighter who has worked his way to the top of the division. I know that this will be a great fight for both of us. May the best man win. “I have to leave a good impression in this fight so that I can continue to get big fights here in the U.S. I’m going to show everyone what kind of fighter I am. “I’ve had fantastic sparring and feel great. I’ve trained so hard for this fight. I feel like I’ve taken my game to the next level. “I love fighting at Barclays Center. It’s a great atmosphere. This is a chance to be my breakout fight on Saturday night. I can’t wait to get in the ring. “I’ve grown a lot as a fighter. I’ve gotten better as my competition has gotten better. It’s a steady rise and I’m happy with where I’m at. “Martin used to be a world champion and that’s what I eventually want to be. I’m 100 percent focused on him. I have to focus on doing everything to win this fight. “My trainer Keith Trimble is one of the most underrated trainers in the sport. He’s done a fantastic job teaching me fundamentals. It’s been a tough road for us but this fight is going to bring us a step closer to our goal. “I’m here to work towards getting my belts back. I’m going to keep working and grind until I’m holding the gold. “I have the advantage everywhere over Kownacki. I’m just a better fighter but I’m also bigger and stronger. “We’re just getting everything perfect right now. My team has done a great job getting me here and I feel great. Everything is leading up to fight night in Brooklyn. “I feel strong and ready. I’m older and wiser now and I’m really taking into consideration what it takes to be a champion. I got a taste of it but next time I’m coming to stay. “Kownacki is a good fighter. He’s very tough. There are some things we’ve worked on in the gym and we feel prepared for whatever he brings on Saturday. “I’m excited and honored to have a chance to join Oscar De La Hoya and Manny Pacquiao as six-division world champions. I’m going to go out and perform and give the fans some excitement. “It’s one step at a time for female boxing but this is a very important fight. Things are on the rise but there is still a lot of room to rise up. This fight is another way to show people how many talented female fighters there are out there. “Moving up in weight has been great. I’ve been able to eat and I feel stronger than ever. I think it’s going to lead to one of my best performances. “Fighting in Brooklyn is always a great thrill. Barclays Center is right around the corner from house and it’s great to have a lot of supporters out there cheering me on. I love Brooklyn and I’m going to give them another night to remember. “I’m very proud to be in this position. I feel relaxed because I know my team has worked hard to get me to this big fight in the U.S.
“I can box or brawl. I like to keep my options open and see what the fight calls for. I’m here to put on a good show.